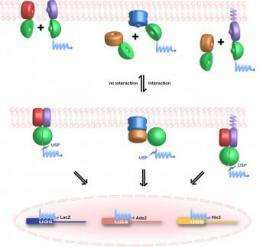 (PhysOrg.com) -- To engineer better, more productive crops and develop new drugs to combat disease, scientists look at how the sensor-laden membranes surrounding cells control nutrient and water uptake, secrete toxins, and interact with the environment and neighboring cells to affect growth and development. Remarkably little is known about how proteins interact with these protective structures. With National Science Foundation funding, researchers at the Carnegie Institution's Department of Plant Biology are using the first high-throughput screen for any multicellular organism to pinpoint these interactions using the experimental plant Arabidopsis. They have analyzed some 3.4 million potential protein/membrane interactions and have found 65,000 unique relationships. They made the preliminary data available today to the biological community by way of the Website www.associomics.org/search.php. Since proteins are similar in all organisms, the work is relevant to fields from farming to medicine. "This is just the beginning," remarked Wolf Frommer director of Carnegie's Department of Plant Biology. "Arabidopsis shares many of its genes with other organisms including humans. As the library of interacting proteins grows, scientists around the world will be able to study the details of protein interactions to understand how they are affected by forces such as climate change and disease and how they can be harnessed to produce better crops and medicines more effectively." All of a cell's internal machinery relies on the binding of proteins. Complementary shaped proteins dock with one another to start processes, such as turning on a gene or letting in the proper nutrient. These membrane proteins make up some 20-30% of the proteins in Arabidopsis, a relative of the mustard plant. The team uses a screen called the mating-based protein complementation assay, or split ubiquitin system. Ubiquitin is a small protein. The scientists fuse candidate proteins onto a version of ubiquitin that is split in half. When the two candidates interact, the two halves of the ubiquitin reassemble, triggering a process that liberates a transcription factor—a protein that switches a gene on—which then goes to the nucleus. When genes are turned on in the nucleus, the researchers are alerted to the successful interaction. The ultimate goal is to test the 36 million potential interactions as well as the sensitivity of the interactions to small molecules with a high-throughput robotics system. The group plans to start a second round of screening at the end of this month to test another 3.4 million interactions.